Should we get our almost-twelve year one? Most of our seventh-grade daughter’s peers already have cell phones. However, she was content without having one for her entire first year of middle school. Until at the end of the last school year there was a mix up with something at school in terms of pickup up and drop off times and she had no way of calling me to let me know. And because she’s quite introverted she was too shy to ask someone to use their phone. For this reason, she broke down and started asking for a phone. She didn’t want to have to ask anyone to use their phone, and she wanted to be able to message and call my husband and me if need be. My husband and I know firsthand how all-consuming having a device can be because we have had some serious fights in our house when we have asked our oldest daughter to get off of her phone. She has even had moments of going berserk when we’ve had to take her phone away from her followed by withdrawal symptoms. These symptoms include moodiness, irritability, and anger. She seemed to become very dependent on her phone, and I didn’t like it at all. So, you can see why I was afraid of giving our second daughter a cell phone. I didn’t want to have arguments with her, nor did I want to have her depend on it for her happiness. Our soon to be twelve-year-old daughter is always being creative and finding things to do that do not involve being on a device. Once in a while, I would peep out the kitchen window while I’m doing dishes and see her bouncing on the trampoline. I would peek into her room and find her making slime, or making up dance routines with her friend, or she would simply be reading a book. Basically, she didn’t use a device as a distraction and instead used her imagination instead. I loved seeing that and was so afraid she would lose it once she got a cell phone. If someone in our house could win a prize for being the most present it would be her! In fact, I would always notice her from the rearview mirror while I’m driving just staring out the window. When we ate at restaurants she never asked us for a device to go on. She simply talked to us. I never once had to tell her to “be present” simply because she didn’t have anything in her face distracting her. In other words, being present is all she knew. In all honesty, I’ve lost count at how many times I’ve had to have the “you’re not being present” conversation with my oldest daughter. Needless to say, I didn’t want my other daughter to lose that “being in the moment” feeling. Last year my daughter wrote an essay about why she felt her and her best friend were so close with one another and one of the reasons she wrote was because “they weren’t in constant contact with one another because they didn’t have phones yet”. She wrote, ” we actually miss one another when we’re not together and have so much to catch up on when we see each other again.” When I read this I thought, wow, it’s so true! The thing with communicating with peers through a device is they feel they need to reply instantly otherwise they are afraid the other person will be offended, upset, or think they are being ignored. I had this conversation with my fifteen-year-old in the past and she admitted to having this sense of urgency to respond right away. I let her know it’s impossible and unhealthy to always be able to reply right away and people will understand if you are busy doing something. You can’t be on your cell phone 24/7. I also noticed how this can cause feelings of anxiousness and this is another huge reason I was afraid to let our twelve year old get a cell phone. I don’t want them to own a cell phone and then have it affect their mental well-being. 5. Last but not least, would she know how to stay safe and interact safely and responsibly online? This was a big concern for me because while I thought I was monitoring my eldest daughter’s online behavior when she first got a phone I actually ended up finding out she was engaging in something online that didn’t seem safe. For this reason, my worry kicked in at the thought of something unsafe happening online to our middle daughter. Thankfully, TELUS is empowering Canadians to stay safe in a digital world. I wish I found this TELUS Wise information when I gave my eldest daughter her first cell phone! 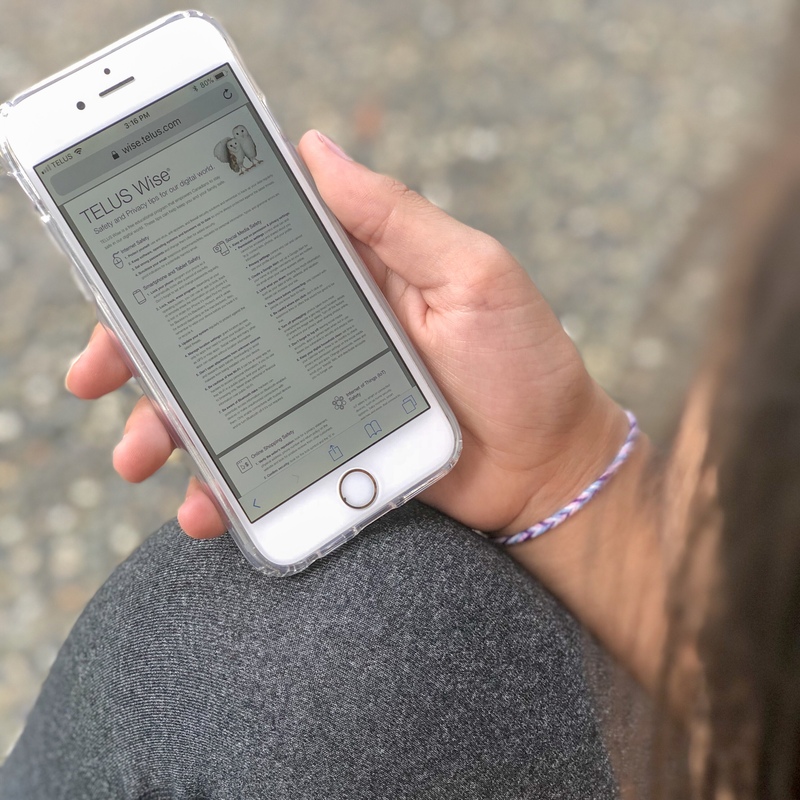 After going through some of the resources with my daughter such as the TELUS Wise Smartphone contract and parents guide this helped ease my worry and concerns. If you’re worried about giving your child access to their very first cell phone the TELUS Wise program is a great information resource to help you and your child navigate safe online phone use. In short, it totally helped us start a dialogue about online issues and now she is the proud owner of her very first cell phone with the resources she needs to have a positive experience online at her fingertips thanks to TELUS. PS. If you do get your child a phone, don’t forget to have a conversation about the importance of being kind online – consider signing the TELUS Wise Digital Pledge together! *Thank you TELUS for sponsoring this post and for empowering Canadians to say safe in a digital world.